As the founder of our Law firm, she brings in extensive rich experience in advising international and reputed Indian clients. She is a strategic thinker plays advisory role and is on board with investment banks and corporate companies. 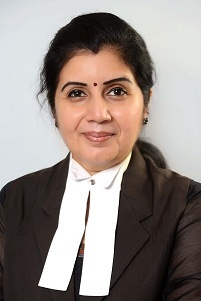 Her notable specializations include handling high stake litigations in Courts, Corporate mergers and acquisition, joint ventures, foreign Direct investments [FDI], market entry strategy, and corporate restructuring, domestic and international commercial Arbitrations, Cross Border business transaction & issues, FEMA Regulations etc. Clients engage her for above services on retainer-ship basis or on assignment basis. She pursued her academic law graduation at Law School Bangalore and enrolled as an Advocate in Bar Council of Tamil Nadu and Puducherry. She started her career by assisting senior Advocates in various courts, and later she started her own independent practise as a corporate legal counsel. She is also empanelled in Arbitration Centres. She is unique when it comes to understanding clients' requirement, quick implementation of legal process, update & follow-up, social responsibility and much more. Her forte is in providing Litigation Support, advisory services, contract management, compliance and due diligence support services to various reputed corporate clients, Multinational Companies, Infrastructure developers, Banks etc. As a part of corporate experience, she has worked on several acquisitions and assert purchase matters, across different jurisdictions. She represents numerous clients in high profile litigations arising out of commercial contracts and other disputes before a host of forms including High Courts, recover tribunals, Company Law boards.